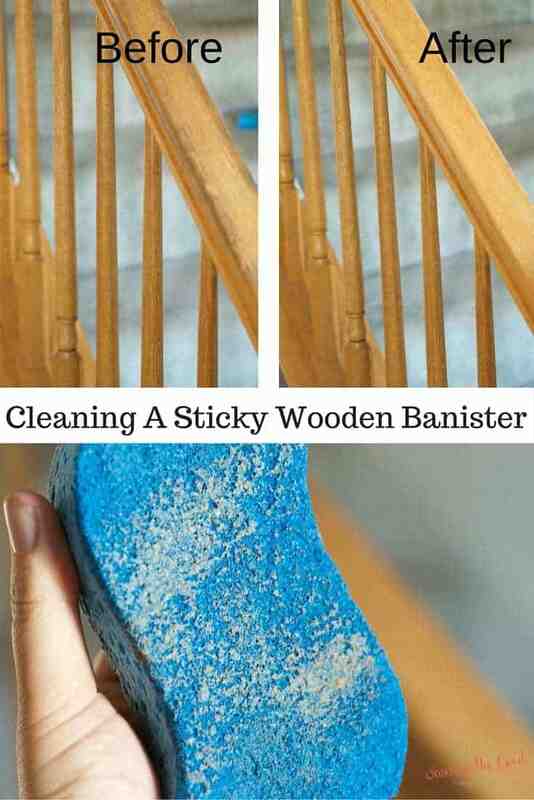 Cleaning sticky wooden bannisters is easier than you think! Just a bit of wiping with the right product and you have clean, fresh bannisters in no time! I will be the first to tell you that I am not very good at keeping a clean house. Dishes sit stacked in the sink, they spill over onto the counter top and sometimes the large pots have to sit on the floor waiting for someone to pick them up and put them in the sink to be washed. Clutter is everywhere in my house from the kitchen table, to the half wall in the family room to going up the steps to the second floor. Don’t even get me started on the space I call my ‘desk’. I have one. And I can see about 8 square inches of it at any one time. They get dusted before every Christmas when the stockings are hung on them (no fire place at our house) so I know that once a year they will be wiped down and the spindles will be vacuumed. This cleaning process might happen one more time in the year but that is about it. (see a post I wrote about making your own Class Photo Ornament….super easy!) The other day I had HAD IT. It took me this long to get grossed out enough to deep clean the wooden bannisters in our house. What causes wooden bannisters to get sticky? It is summer and the humidity is currently at about 75% so that means the air is trying to give you a hug and wants to make you feel like you are in a sauna. You many not like the sauna but humidity doesn’t care and wants to make everything around it miserable. It even makes the bannisters in my house miserable. Yes. The bannisters are so miserable that they are sticky. The humidity combined with the dirt, oils, and dust on wooden railings will make them sticky. Sticky from 14 years of us running our hands up and down them. Sticky from grubby kid hands clutching them as the go up and down step by step. Sticky because the humidity is clinging to the grime too much and making it miserable. So we were at Target and I grabbed a bottle of Murphy Oil Soap and thought if this didn’t do the trick, nothing would. I followed the directions on the back of the bottle and diluted it in about a half gallon of warm to hot water. It said I could dilute it in a gallon of water but I KNEW we needed all the concentrations we could get on this project. Steps for cleaning sticky wood. Wipe down the banisters of loose dirt. Use a Scoth-Brite pad with the scrubbie on the one side because I knew this bannister needed HELP. No wussy sponge was going to do the job. Now, if I did this every 6 months or even every year a regular sponge might do the trick. Use a small drizzle of Murphy Oil Soap on the rough side of the sponge and rub on the sticky wood. Using small circles, scrub and wipe off the stickiness. 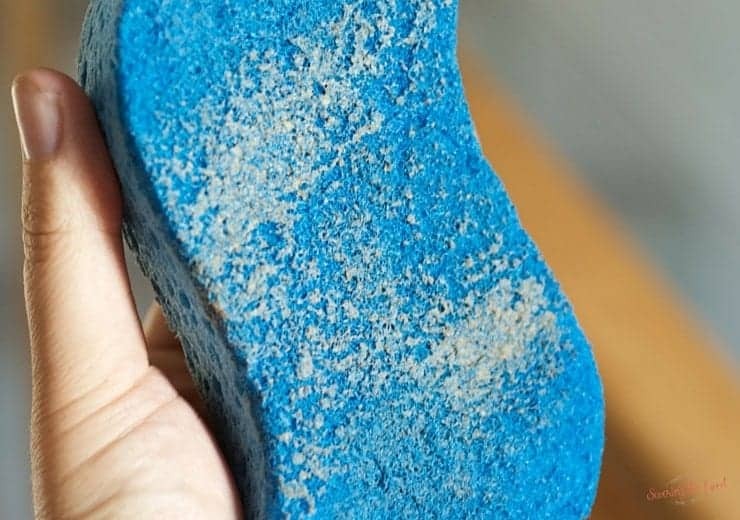 Wipe down with the soft side of the sponge. Have you ever had a pedicure where the dead skin just ROLLS off your feet? Not to be gross, but that is exactly what it was like cleaning this bannister. The gunk was ROLLING off the wood. It was oddly satisfying how easy it cleaned up. Now, the bannister did have a different ‘feel’ when I was all done. But I had just taken off all the gunk and oils from our hands over the last 14 years so of course it was going to feel different. I didn’t add any other treatment to the wood after I was finished. I just let it go natural. Let’s all cross our fingers that it doesn’t take me another 14 years to clean it again.